Swilcan Bridge Photo time for Thorbjorn. Rude not to. And the answer was yes – just! 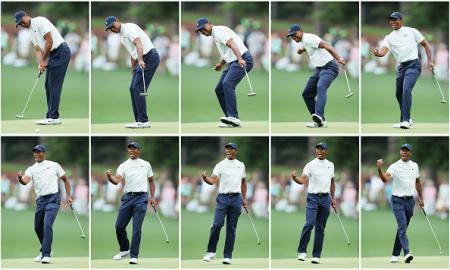 He started with a birdie, but then dropped two shots on the second, and another on the third. The pressure was getting to him early on. 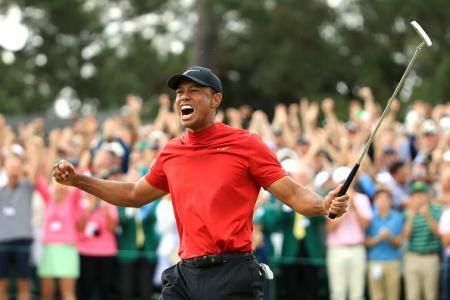 He fought back with consecutive birdies to repair the damage, and then ground out 9 straight pars, before he birdied again on the 15th with a monster putt that finally sealed his victory. In the end he got over the line with a two shot victory over the Americans Brooks Koepka and Chris Stroud. It was a brave performance after such a shaky start. Thorbjorn keeping it together off the tee. 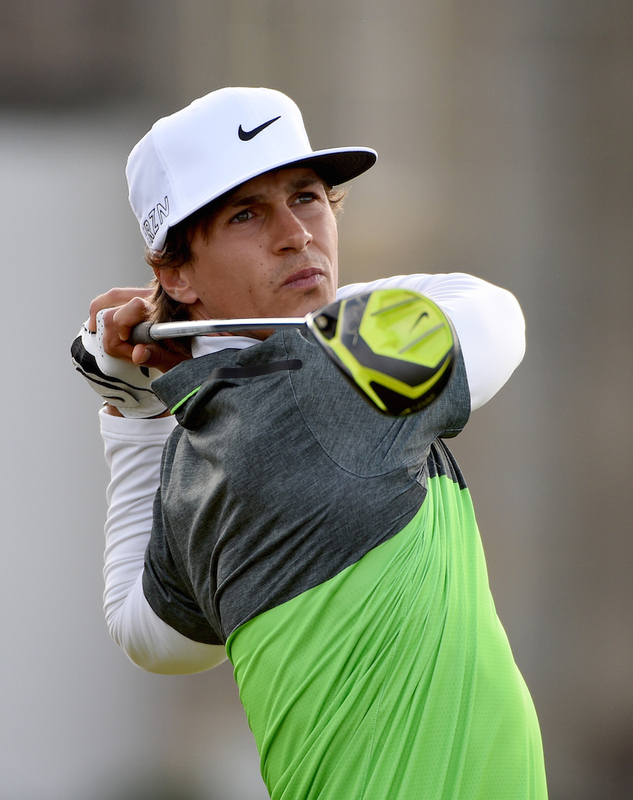 This was Olesen’s third European Tour victory, and it has secured his place on the European Tour until 2017, whilst moving him into the top 75 in the world and into the top 25 in The Race to Dubai. It’s been an excellent week at the office for him for sure. 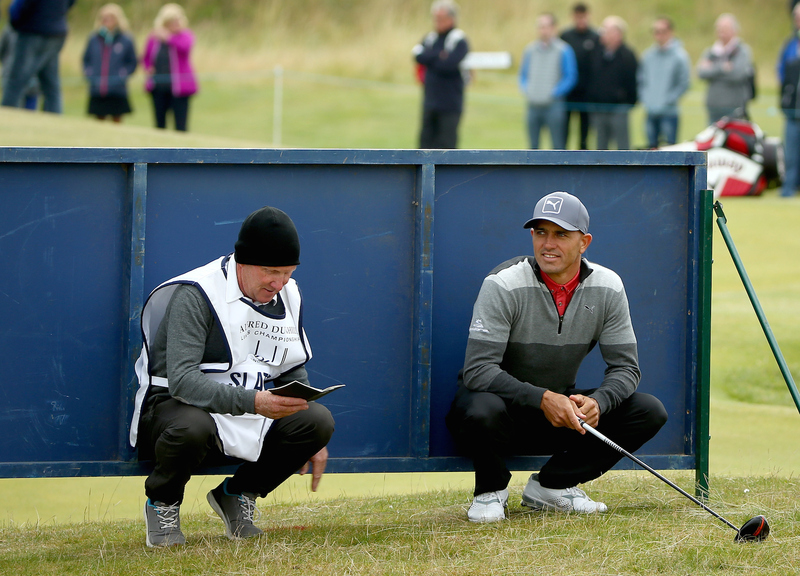 Surf legend Kelly Slater seeking shelter on a cold day at St Andrews. 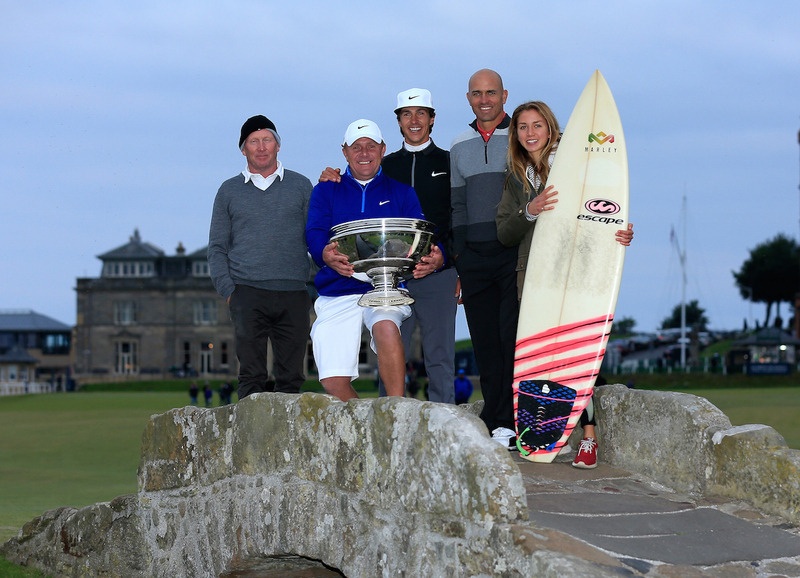 Surfing legend Kelly Slater, Olesen’s partner in the Team Championship, had the pleasure of walking the 18th hole with the winner. Six years ago he partnered Simon Dyson when he won. 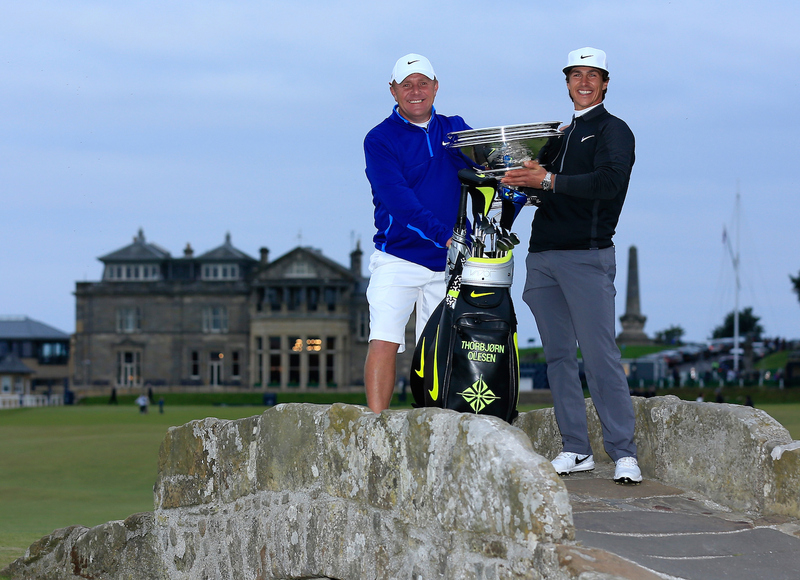 Slater said: “I’ve now played twice in this competition and twice I’ve been partnered with the professional winner. It’s amazing. In 2009 with Simon it was a great experience. But I think this one was better because it was great to see Thorbjorn come through to win – and also because of my own birdie three on the 18th green. That was a wonderful putt for me to make. Brooks Koepka, World No 17, piled on the pressure, shooting five under, to finish as clubhouse leader on 16 under. He dropped a shot on the 13th, but made six birdies. He just could not find a birdie on the final three holes to force a play off. It was a good day for Austrian Bernd Wiesberger, who opened The GolfPunk Clubhouse at the Open this year. He shot six under for the day, just dropping a single shot on the par 3 11th, and missing a straightforward putt for birdie on the 18th. Bernd’s had a good season with a win at the Alstom Open de France, and today’s performance brings his season earnings to a healthy €1,900,553. He was partnered with Englishman Chris Woods, who shot a bogey-free 7 under for the day, to finish tied fourth with Wiesberger, Aphibarnrat, Lagergren and Herbert. Expected challenges from Ernie Els, Brandon Grace and Graeme McDowell never materialized. Stewart Cink, Open Champion at Turnberry in 2009, is also worth a mention in dispatches. He shot a five under to finish tied ninth. The Big Easy didn't show today, but here he is anyway. 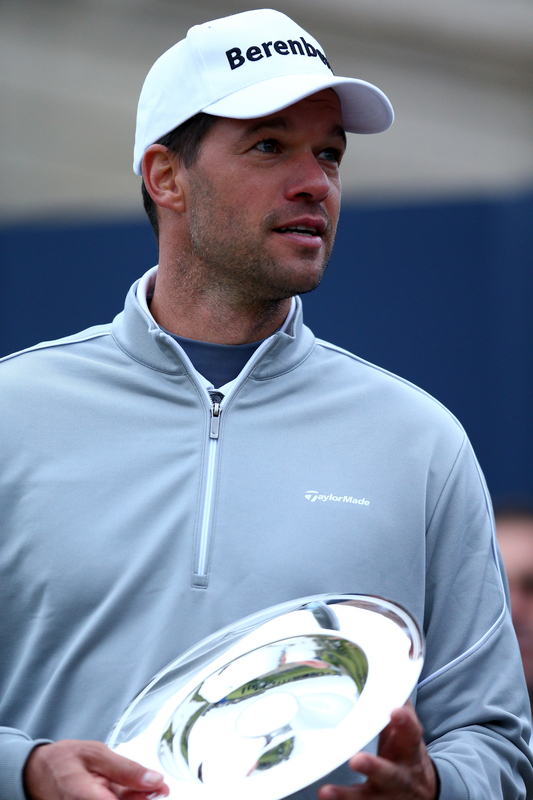 The German pairing of Florian Fritsch and former Chelsea and Bayern Munich footballer Michael Ballack won the team event. Fritsch has a terrible flying phobia, which is a huge impediment for a professional golfer in this day and age. 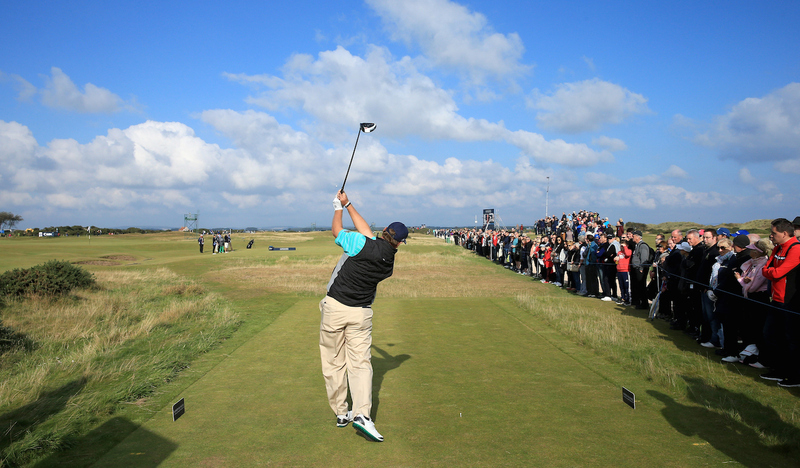 The celebrity amateur component of the Dunhill is core to this unique event, and playing were film stars Andy Garcia and Hugh Grant, rock legends Don Felder, Ronan Keating and Huey Lewis and sporting idols including Sir Ian Botham and Sir Steve Redgrave, who have both played in all 15 Alfred Dunhill Links Championships. Cricketers Kevin Pietersen and Shane Warne, Irish rugby star Brian O’Driscoll, record-breaking jump jockey A.P.McCoy, star international footballers Michael Ballack, Johan Cruyff, Alessandro del Piero, Ruud Gullit and Andriy Shevchenko, and Wimbledon hero Tim Henman, were also there. Star studed indeed, and a great draw for all sports fan and young autograph hunters, who literally had a field day. Kelly Slater makes his mark.